You're HERE! 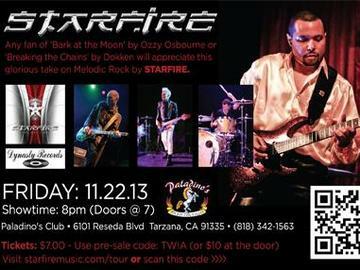 If you've always admired Vernon Reid from Living Colour or the music of Doug Pinnick with King's X then you can't miss STARFIRE performing this November 22nd in LA where the band will unveil songs from its third studio album "The Way I Am." Get your tickets NOW, tell your friends, BRING your friends and ROCK OUT. Hundreds of FREE parking spaces at the club and across the street (Topham St.) at the Reseda Metro Orange Line station (6065 N. Reseda Blvd., Tarzana, CA 91335). The hell are you waiting for? Pick your quantity and click check out now! Must be 21 or older on the day of the performance to be admitted for attendance.